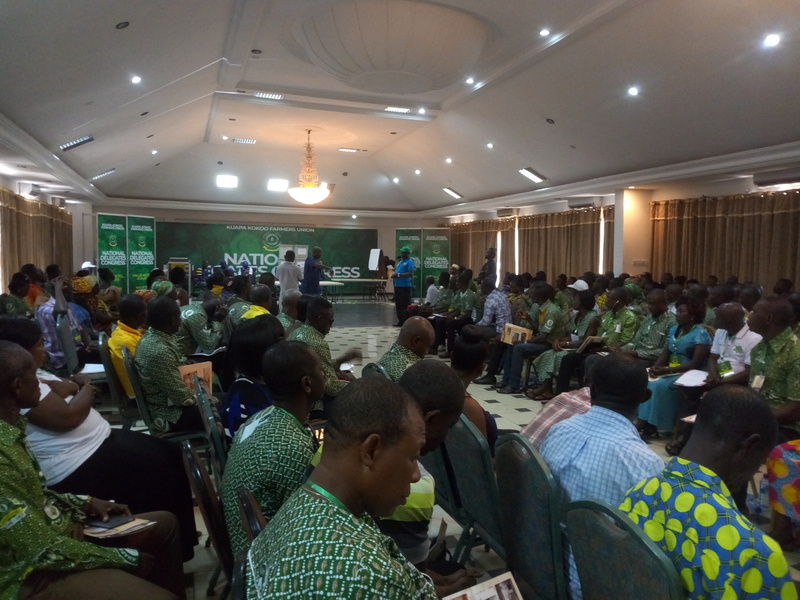 The Institute for Democratic Governance (IDEG) Ghana has lauded Kuapa Kokoo Cooperative Farmers Union, for their “exceptional” organisation of a very transparent, free and fairly contested National elections at their 6th Delegates Congress held on Friday, August 10, 2018 at Miklin Hotel in Kumasi. The 100% attendance Congress saw the election into office of new Executives to mann the affairs of the farmer-based organisation for the next four years. Mr. Haruna Yoda, a representative from IDEG, who made this observation on behalf of the civil society organisation after the polls said he was highly elated at the level of discipline and decency with which the farmer delegates conducted themselves before during and after the elections. 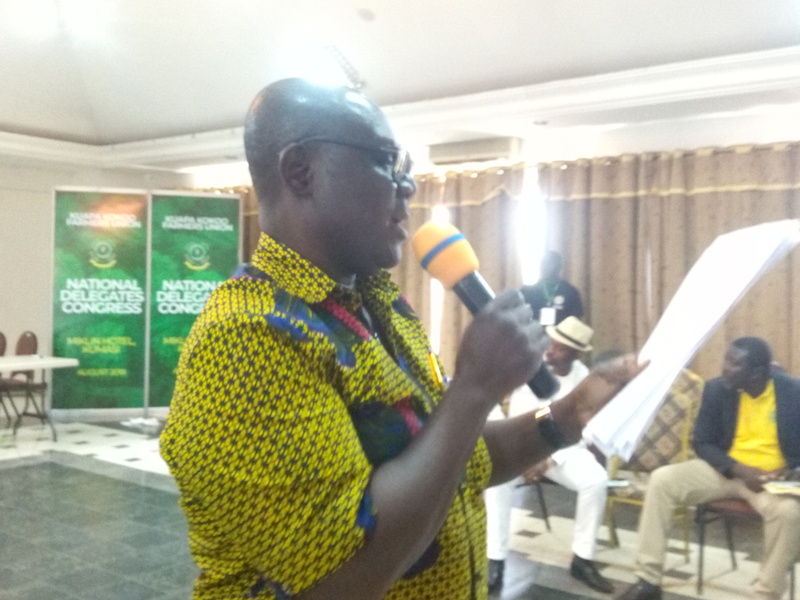 He expressed his satisfaction with the transparency and the fair manner in which candidates presented their manifestos and the general conduct of the elections by officers from the electoral commission of Ghana – Ashanti region. He said as an observer, he learnt a lot from the way and manner the polls were conducted, and therefore promised to share his experience with other organizations and his leadership. “Kuapa Kokoo has really demonstrated high sense of integrity and I have really learnt a lot worth sharing. Having gone through the polls successfully, I will urge you all to come together and work as a formidable force than never before and ensure that the growth that we are all looking for is attained to make Ghana proud” he noted. His admonition was also corroborated by Mr. Maurice K. Amoo, Program Officer, Ghana – UTZ & Rainforest Alliance. “Our core values are to strengthen farmer-based organisation to ensure sustainable farming practices. Therefore, what you have demonstrated here today is heartwarming and is worth sharing. I will entreat you all to stay focused and stay united to keep your position as the shining example for other farmer-based organizations in Africa “, he said. Mr. Edward A. J. Akapire, Head of Region, Fairtrade Africa West Africa Network, also commenting on the event congratulated them for such a world class display of appreciation for democracy and reminded the members of Kuapa Kokoo Cooperative Union about the important role they play in the socioeconomic affairs of the country. He further urged them to give their maximum support to their new leaders for them to succeed. “Even though you have elected new executives to stir the affairs of the union for the next four years, they can never succeed without your maximum support. It is only peace and unity that can propel Kuapa to greater heights. Therefore, you have to come together and support your new executives to achieve”, he said. The national delegates Congress saw the election of seven new members tasked with the responsibility to stir the affairs of the farmer-based organisation for the next four years. 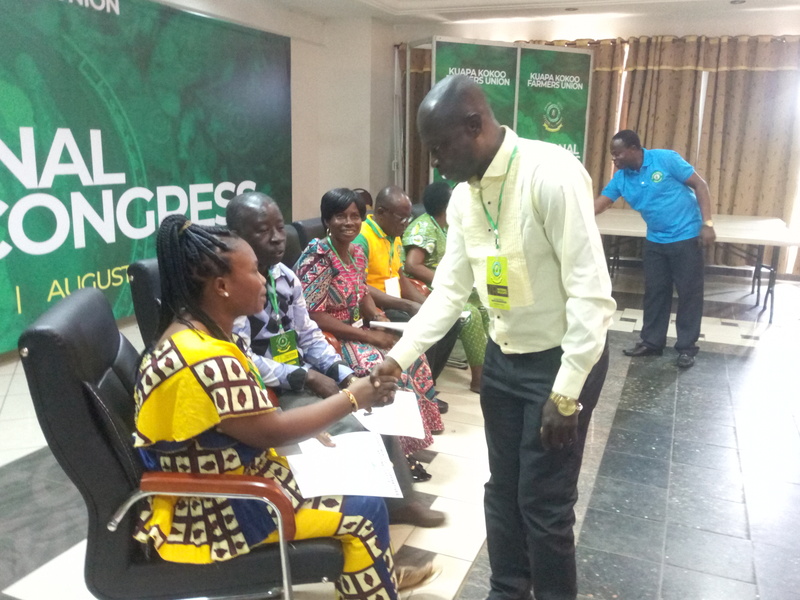 At the presidential polls, Madam Fatima who went unopposed but had to still be voted for in order to be confirmed received an overwhelming endorsement from the delegates. She polled 158 votes out of 169 votes cast representing 93.5% of the total valid votes cast against 11 dissenting votes. Three Executive Members including Mary Appiah, Mary Kosi and Enerst Boateng were also elected to be part of the Executive Council. In a closely contested contest, Mr. James Agyekum Kwarteng who won the Vice-President position polled 87 votes, representing 51.2% while his only contender in that category Nana Opoku Asiedu II polled 83 votes, representing 48.8% loosing by 4 votes. Madam Cecilia Appianim polled a surprise with 77 votes, representing 45.8% while her male competitors, Appian Kwarteng and Yaw Sraha polled 49 and 42 votes, representing 29.2% and 25% respectively. The Assistant Treasurer Mr. Sampson Cobbina also unopposed like the President’s position polled 115 confirmation votes against 55 dissenting votes. Mr. Edward Yaw Mensah a senior officer from the Electoral Commission (EC) of Ghana – Ashanti region supervised the entire elections. He won the admiration of all and was highly commended for his level of expertise and transparency clearing every shadow of doubt on the outcome of the results. Once again flighting the confidence in our Electoral system. Madam Fatima Ali speaking on behalf of all the newly elected executives amidst cheers and applause from the delegates, thanked all for such an overwhelming support and confirmation of her leadership. She pledged never to disappoint the farmers with the confidence they have reposed in her. Commenting further, Madam Fatima Ali called for the protection of the farmers money and interest in unison with transparency, probity and accountability. She also called on the rank and file of the farmer-based organisation to be circumspect in their dealings in order not to derail the successes chalked by the previous leadership. She urged all to reconcile as the build the Kuapa brand, shun nay sayers and focus on improving the lots of the farmers. She intimated that “elections are over so we must fight a common course to position the organization on the global platform for proper recognition and progress”. The Deputy Registrar from the Department of cooperative Ghana during the swearing into office commended the new Executives for emerging victorious and reminded them of their oath of office. He admonished the Executives that any breach of this oath and not following the properly laid proceedings for addressing internal conflicts can lead to your expulsion from the union hence they must all be guided by these bye laws.